Information on all Candy types in Pokémon: Let's Go and how to use them. In Pokémon: Let’s Go, there are several different Candy types that can be used to buff your Pokémon. 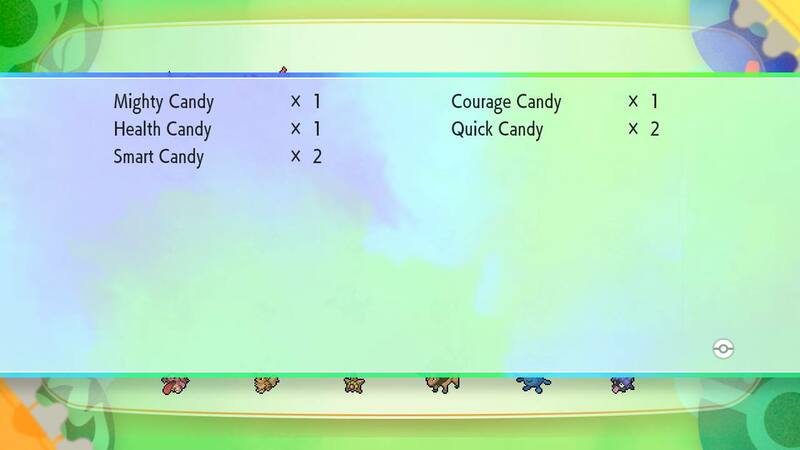 All of these Candies fall under three main categories including Stat Candy, Species Candy, and Rare Candy. As the name suggests, Stat Candy buffs individual stats of your Pokémon like Attack or Defense. Meanwhile, Species Candy gives select Pokémon an increase of +1 across all stats. Finally, Rare Candy works the same as the original games by increasing a Pokémon's level. To get Candy in Pokémon: Let’s Go, you’ll want to catch as many Pokémon as you can. You’ll also want to utilize the game’s new Catch Combo mechanic to increase the chance of getting a Candy drop when you catch Pokémon. After catching multiple Pokémon, you can open your Pokémon Box and transfer them over to Professor Oak. In return, Professor Oak will give you Candy along with a bonus when you send him multiples of the same Pokémon. Want to know more about the different Candy types in Pokémon: Let’s Go? Read on for information on all Candy types in Pokémon: Let’s Go! There are several different Candy types in Pokemon: Let's Go including Stat Candy, Rare Candy, and Species Candy. Alongside the three main tiers of Candy listed above (Rare Candy, Stat, Candy, Species Candy), there are also different Candy sizes in Pokémon: Let’s Go. When it comes to a Candy’s size, this relates to the level of Pokémon that Candy can be used on. For example, a regular Candy and Species Candy can be used on any Pokémon that’s Lv. 1 and above. Alternatively, L Candy can only be used on Lv. 30 or above Pokémon, while XL Candy can only be used on Pokémon Lv. 60 or above. In Pokémon: Let’s Go, there’s only 1 type of Rare Candy. Using Rare Candy, you can increase the level of any Pokémon by 1. When it comes to Stat Candy, there are 6 variants that come in different sizes from regular to L and XL sizes. 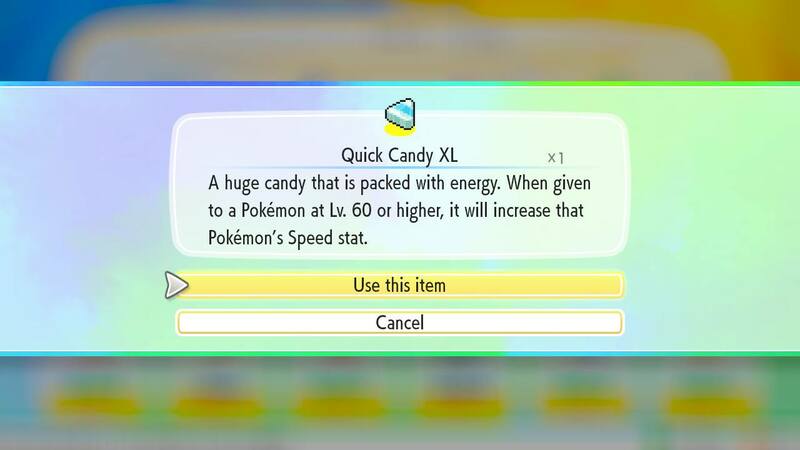 Stat Candy comes in different sizes from regular to L and XL in Pokemon: Let's Go. Below, you’ll find a list of all Stat Candy types and their effects in Pokémon: Let’s Go. Courage Candy: A Candy that’s packed with energy. When given to a Pokémon at Lv.1 or higher, it’ll increase that Pokémon's Sp. Def stat by +1. Courage Candy L: A big Candy that’s packed with energy. When given to a Pokémon at Lv. 30 or higher, it’ll increase that Pokémon's Sp. Def stat by +1. Courage Candy XL: A huge Candy that’s packed with energy. When given to a Pokémon at Lv. 60 or higher, it’ll increase that Pokémon's Sp. Def stat by +1. Health Candy: A Candy that’s packed with energy. When given to a Pokémon at Lv. 1 or higher, it’ll increase that Pokémon's HP stat by +1. Health Candy L: A big Candy that’s packed with energy. When given to a Pokémon at Lv. 30 or higher, it’ll increase that Pokémon's HP stat by +1. Health Candy XL: A huge Candy that’s packed with energy. When given to a Pokémon at Lv. 60 or higher, it’ll increase that Pokémon's HP stat by +1. Mighty Candy: A Candy that’s packed with energy. When given to a Pokémon at Lv. 1 or higher, it’ll increase that Pokémon's Attack stat by +1. Mighty Candy L: A big Candy that’s packed with energy. When given to a Pokémon at Lv. 30 or higher, it’ll increase that Pokémon's Attack stat by +1. Might Candy XL: A huge Candy that’s packed with energy. When given to a Pokémon at Lv. 60 or higher, it’ll increase that Pokémon's Attack stat by +1. Quick Candy: A Candy that’s packed with energy. When given to a Pokémon at Lv. 1 or higher, it’ll increase that Pokémon's Speed stat by +1. Quick Candy L: A big Candy that’s packed with energy. When given to a Pokémon at Lv. 30 or higher, it’ll increase that Pokémon's Speed stat by +1. Quick Candy XL: A huge Candy that’s packed with energy. When given to a Pokémon at Lv. 60 or higher, it’ll increase that Pokémon's Speed stat by +1. Smart Candy: A Candy that’s packed with energy. When given to a Pokémon at Lv. 1 or higher, it’ll increase that Pokémon's Sp. Attack stat by +1. Smart Candy L: A big Candy that’s packed with energy. When given to a Pokémon at Lv. 30 or higher, it’ll increase that Pokémon's Sp. Attack stat by +1. Smart Candy XL: A huge Candy that’s packed with energy. When given to a Pokémon at Lv. 60 or higher, it’ll increase that Pokémon's Sp. Attack stat by +1. Tough Candy: A Candy that’s packed with energy. When given to a Pokémon at Lv. 1 or higher, it’ll increase that Pokémon's Defense stat by +1. Tough Candy L: A big Candy that’s packed with energy. When given to a Pokémon at Lv. 30 or higher, it’ll increase that Pokémon's Defense stat by +1. Tough Candy XL: A huge Candy that’s packed with energy. When given to a Pokémon at Lv. 60 or higher, it’ll increase that Pokémon's Defense stat by +1. Species Candy will increase all stats of a specific Pokemon by +1 in Pokemon: Let's Go. In addition to Stat Candy that buffs the individual stats of a Pokémon like Attack or Defense, you can also pick up Species Candy in Pokémon: Let’s Go. Species Candy is a bit more convenient, as it’ll increase all stats of a matching species of Pokémon by +1. Note that you can only use Species Candy on the type of Pokémon listed by the Candy. For example, an Abra Candy can only be used on an Abra, and so on. You can find Species Candy for just about any Pokémon in Pokémon: Let’s Go, including Articuno, Moltres, and Zapdos. To recap, you can get Candy by catching Pokémon and transferring them to Professor Oak in Pokémon: Let’s Go. You can also choose the option to “Take Pokémon For a Stroll” in the Save Menu. Using Candy, Joe was able to defeat a Level 65 Pidgey using a Level 5 Pidgey, as that Level 5 Pidgey had Max AVs for each stat. Keeping this example in mind, Candy is an extremely important component in Pokémon: Let’s Go. By catching Pokémon and collecting Candy, you’ll be able to make your favorite Pokémon more efficient in Pokémon: Let’s Go. So, have you used Candy to buff Pokémon in Pokémon: Let’s Go? Let us know down in the comments below! For more on Pokémon: Let’s Go, be sure to check out some of our previous guides including how to get to the Power Plant in Pokémon: Let’s Go, how to learn all Special Techniques in Pokémon: Let’s Go, and where to get all Outfit Sets in Pokémon: Let’s Go. By reading through this guide, you should now know all Candy types and what they do in Pokémon: Let’s Go.